Common horsetail has sterile and fertile stems. The sterile stems, pictured above, are green with many thin branches. Sterile stems are hollow, textured by 10-12 longitudinal ridges, and grow to 70 cm tall. The fertile stems appear earlier than the sterile stems, grow to 30 cm tall and wither quickly. They are whitish to brownish, unbranched, fleshy, and thicker than the sterile stems. Fertile stems bear a single, 2-3.5 cm long cone. 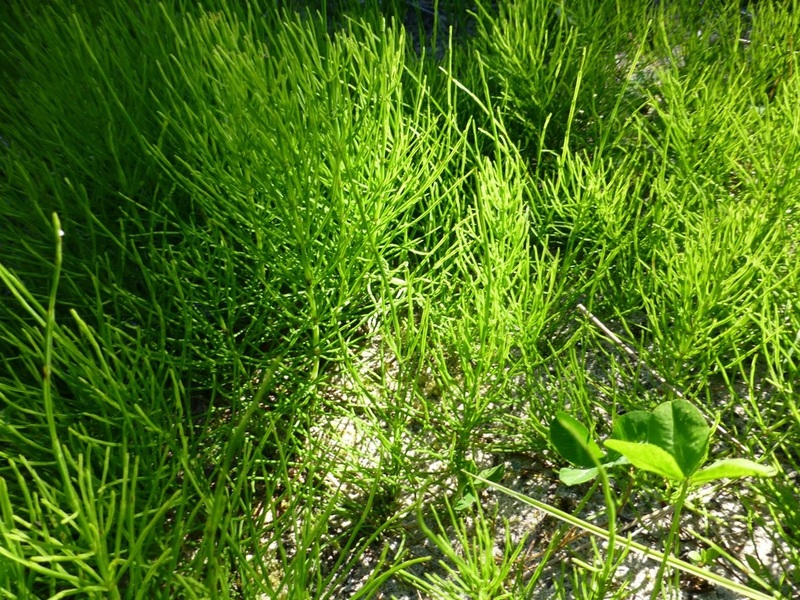 Common horsetail grows in a variety of moist to wet environments, including swamps, fens, meadows and forests. It may appear weed-like along roadsides and other disturbed areas. It is found from low to alpine elevations. It is a common plant throughout BC and is found across much of North America, as well as Eurasia, North Africa, New Zealand, and Greenland. A number of other horsetail species are found in BC; those that are commonly found on or near the Central Coast include swamp horsetail (Equisetum fluviatile), scouring-rush (E. hyemale), and giant horsetail (E. telmatiea). Swamp horsetail is distinguished by its unbranched, or sporadically branched stems that have thin walls and a very large central cavity (comprising 70% or more of the cross section of the stem). Scouring rush is unbranched, and stems are more hollow than common horsetail. Small giant horsetail specimens are most similar to common horsetail, but can be distinguished by the more numerous, larger, and looser sheaths on the stems. Indigenous People in the Pacific Northwest used common horsetail and other Equisetum species as abrasives for polishing a variety of tools and wooden objects, such as dishes, arrow shafts and canoes. The presence of silicon dioxide in the cell walls of Equisetum species means that they are rough to the touch, and excellent abrasives. Consuming horsetail in large quantities is poisonous to livestock, and most likely to humans as well. However, several Coast Salish and Nuu-chah-nulth peoples would harvest young, tender shoots in the springtime and eat them raw. Horsetails are a very ancient group of plants, and fossil evidence shows that common horsetail relatives once grew to the size of trees alongside dinosaurs. 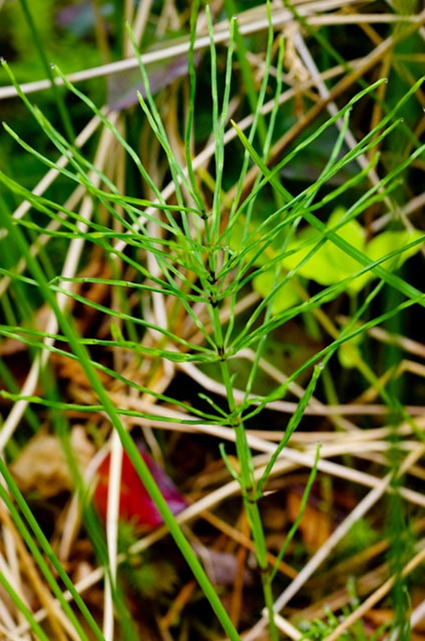 After the eruption of Mount Saint Helens in Washington State, common horsetail was the first vascular plant to force its way through the debris. Equisetum arvense L. In Klinkenberg, Brian. (Ed.). E-Flora BC: Electronic Atlas of the Plants of British Columbia. Lab for Advanced Spatial Analysis, Department of Geography, University of British Columbia, Vancouver. Accessed 15/01/2015. Pojar, J. and MacKinnon, A. (1994). Plants of Coastal British Columbia. Vancouver, BC: Lone Pine Publishing. P. 430. Bea Proudfoot, Kelly Fretwell and Brian Starzomski (2016).